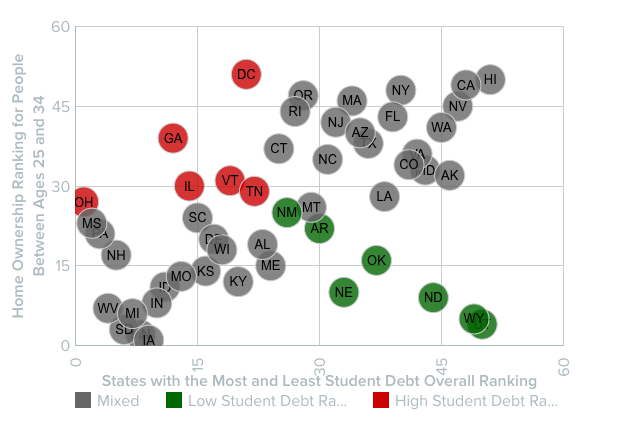 Overall, Ohio is the worst state for student loan borrowers, and Hawaii is the best. Thirty-nine percent of non-owners believed they needed a down payment of 20 percent or more when most buyers have a down payment of six percent or less. As of 2016, 71 percent of non-homeowners believe student loans are hindering their ability to buy, and more than half of those borrowers believe student loan debt will keep them from buying a home for at least another five years. WalletHub recently published its 2017 “States with the Most and Least Student Loan Debt” list, which ranked each state and the District of Columbia based on 10 key measures of indebtedness and earning opportunities. The measures include factors such as average student loan debt, student debt as share of income, share of student loans in past-due or default status and unemployment and underemployment rates for millennials. According to the Federal Reserve Bank of New York, Q1 2017 total outstanding college loan balances were at $1.34 trillion — a $34 billion increase from Q4 2016. Overall, Ohio is the worst state for student loan borrowers. Although the state ranks third in student loan indebtedness, the lack of access to grants and student work opportunities makes it hard for borrowers to lower the number of loans they’ll need to make it through college and earn the salaries needed to pay back loans after college. On the other hand, Hawaii is the best state for student loan borrowers thanks to lower student loan balances, rock bottom levels of loans in past-due or default status, and unemployment and underemployment rates that are below the national average. When it comes to only looking at the average amount of student debt loan borrowers in each state carry, the Northeastern states of New Hampshire, Pennsylvania, Connecticut, Delaware and Rhode Island are the top five. In New Hampshire, the average student loan borrower has a balance of $36,101, nearly double the amount of Utah — the state with the lowest average balance ($18,873). So, how does a state’s student loan indebtedness ranking relate to the level of homeownership for millennials in each state? The District of Columbia ranked 21st in the level of student loan indebtedness and rock bottom for the level of homeownership for millennials aged 25 to 34. In Q2 2017, the U.S. Census Bureau reported that the District had the lowest level of overall homeownership. Only 39.2 percent of properties in the area are currently owner occupied. Meanwhile, states such as Wyoming and Utah ranked 49 and 50 overall in student loan indebtedness and fourth and fifth in millennial homeownership rates. Hawaii, which is ranked as the best state for student loan borrowers, ranked 50th in homeownership rates for millennials. “Nearly three-quarters of older millennials, many of whom graduated at the peak or immediately after the downturn, said their ability to purchase a home is affected by student debt,” said NAR Chief Economist Lawrence Yun about the results of the 2016 Student Loan Debt and Housing Report. Research shows that education about homeownership programs and tools can go a long way in helping buyers actively begin their home journey, and help them overcome misperceptions about their student debt that might be holding them back from making a purchase. For example, 39 percent of non-owners believed they needed a down payment of 20 percent or more when most buyers have a down payment of six percent or less. “Current non-owners’ ultimate goal of owning a home may not be as far-fetched as they believe,” said 2016 NAR President William E. Brown. “There are mortgage options available for creditworthy borrowers with manageable levels of debt and smaller down payments. View the data sets for each of the top five best and worst states here. Read the full study here. What does student debt mean for housing affordability?